Upper Devonian, Middle Frasnian, Domanik Formation. Borehole Ukhtinskaya-1B, sample 42 (depth 90-91.6 m): fig. 1, 2; borehole Ukhtinskaya-3B, sample 78 (depth 118.5-121 m): fig. 3; the Ukhta River, sampling site no. 3, sample 1681: fig. 4, 5; the Domanik River, outcrop 21, sample 3a: fig. 6-9. Fig. 4-9. Rock samples were disintegrated by 15% solution of acetic acid. Fig. 1, 2. Fine-grained, clayey, bituminous flint-limestone with radiolarians: FF-L001/042, thin-section: 1 - (bar=1,5mm), 2 - detail (=250µm). Fig. 3. Thin-bedded flint-limestone with radiolarians and single Tentaculita: FF-L001/078, thin-section (=250µm). Fig. 4-9. 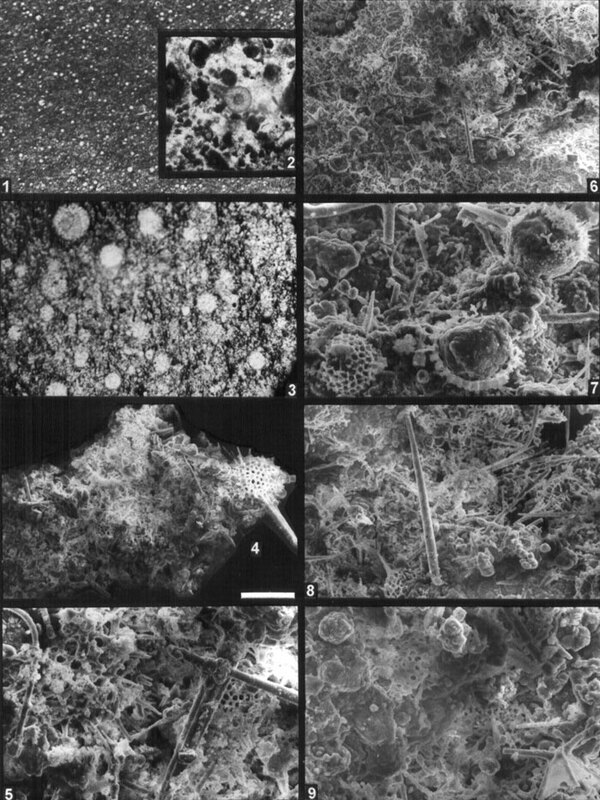 Radiolarian-spongin limestone: 4 - FF-L030/14203 (=133µm); 5 - FF-L030/14218 (=50µm); 6-9 - FF-L030/14105, 6 - (=1,5mm), 7 - detail (=50µm), 8 - detail (=83µm), 9 - detail (=50µm).